“I’ve been trying to get through this damn book again.” Ardee slapped at a heavy volume lying open, face down, on a chair. 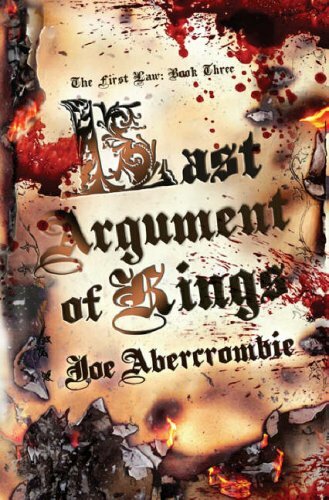 Oh Joe Abercrombie – you kidder! This concluding chapter to the fantasy series The First Law does an excellent job of refusing to compromise the intent of its author. From the initial entry The Blade Itself Abercrombie has tweaked the noses of fantasy literature. I have been following this series from the beginning of my blog and I must admit reading back over the reviews, by the second title Before They Are Hanged, the joke was wearing a bit thin for me. However, by Last Argument of Kings the energy has definitely returned and the story comes to an ending both fulfilling and devastating. There are no easy answers in this fantasy and this is something I really admire about the books. Glokta remains the favourite character from the bunch, returning to his homeland now fatally compromised by the events in the siege of Dagoska. For a man whose justification for his actions in the service of his king, torturing and murdering suspects as a member of the Inquisition, rest upon a certainty that he is in the right given his suffering at the hands of the enemy Gurkish this is a maddening dilemma. If he now too is guilty of treason, how is he any different than his victims? Logen returns from a failed quest still unredeemed, desperately hoping he can become a better man. Realizing he has no choice he returns to the North, where most of his former friends believed he is long dead. In truth they had hoped The Bloody Nine had finally died, known for his propensity for killing friends and enemies in the midst of a bloodlust. Jezal returns from that same quest as Logen welcomed back as a hero. Wishing only to have the chance to live a normal life, following a humiliating experience outside of Adua, instead the manipulative mage Bayaz is positioning him to fill a very special role in the kingdom. War has come. The Gurkish have finally invaded the mainland. A rebellion against the lords has been stirred up. Bethod’s armies in the North are occupying Colonel West’s forces, which are desperately needed at home. Our heroes between them must beg, borrow and steal the means of winning an uncertain peace. Where this book excels is in its frustration of the fantasy novel trope of a final conflict resolving all plot threads. Instead here Abecrombie makes it clear that these events are part of a recurring pattern. The real conflict is between those, like Bayaz, who recognize this, and those who feel that an end is something worth sacrificing for. This is a very entertaining and clever narrative and Abercrombie deserves all the praise for fashioning an unromantic fantasy series. This is great fun.